Hunter Lawrence took his maiden qualification win for the Suzuki World MX2 team, grabbing his first holeshot and checking-out in what were very tricky conditions at the hilly Villars-Sous-Ecot track in France. Heavy rain showers soaked the track before the moto but after a good timed practice, Lawrence and teammate Jeremy Seewer both had good gate picks and good starts in the race as the mud flew all around them. Zach Pichon also rode well for his 14th place finish as the French rider once again stepped-up in the MX2 class. In the MXGP class, Kevin Strijbos continued his run of fifth place finishes and will head into Sunday’s moto full of confidence that he can go even better if he can avoid the misfortune of a rock hitting his goggles. So, a successful race day for the Suzuki World squad of riders, who now head into tomorrow’s races with confidence that they can end the season on a really positive note. With the weather changing all the time, conditions won’t be known until the gate drops but after this qualifying day, they will be ready to tackle anything the Villars-sous-Ecot track can throw at them. MXGP Qualifying Results: 1. Max Anstie (GBR, Husqvarna), 25:02.964; 2. Romain Febvre (FRA, Yamaha), +0:02.476; 3. Jeffrey Herlings (NED, KTM), +0:25.133; 4. Gautier Paulin (FRA, Husqvarna), +0:29.552; 5. Kevin Strijbos (BEL, Suzuki World MXGP), +0:34.938; 6. Tim Gajser (SLO, Honda), +0:43.723; 7. 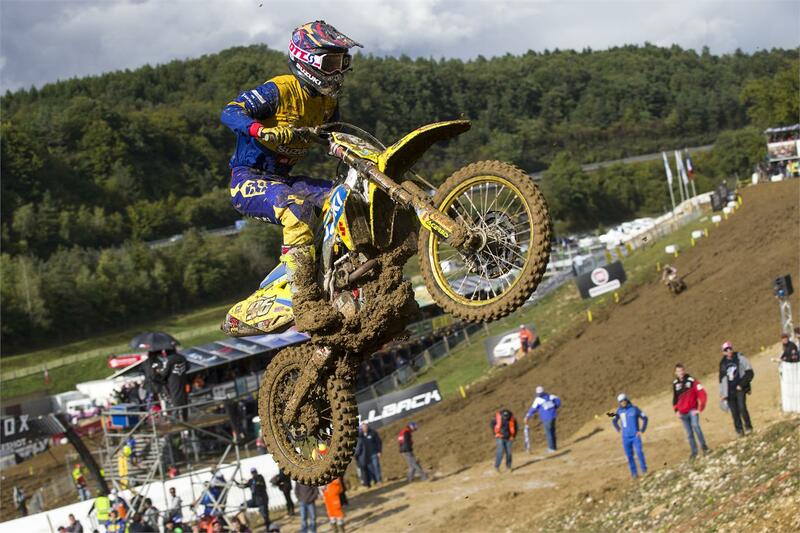 Maximilian Nagl (GER, Husqvarna), +0:46.307; 8. Arnaud Tonus (SUI, Yamaha), +1:01.105; 9. Evgeny Bobryshev (RUS, Honda), +1:01.751; 10. Jeremy Van Horebeek (BEL, Yamaha), +1:10.508. MX2 Qualifying Results: 1. Hunter Lawrence (AUS, Suzuki World MX2), 25:37.327; 2. Pauls Jonass (LAT, KTM), +0:24.073; 3. Brian Bogers (NED, KTM), +0:53.782; 4. Jed Beaton (AUS, Honda), +1:05.076; 5. Davy Pootjes (NED, KTM), +1:14.108; 6. Thomas Covington (USA, Husqvarna), +1:16.127; 7. Brent Van doninck (BEL, Yamaha), +1:19.374; 8. Jeremy Seewer (SUI, Suzuki World MX2), +1:19.976; 9. Julien Lieber (BEL, KTM), +1:30.481; 10. Stephen Rubini (FRA, Kawasaki), +1:38.397; 14. Zachary Pichon (FRA, Suzuki World MX2), -1 lap(s).